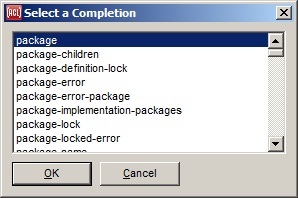 This dialog is displayed by the Search | Complete Symbol menu command when the list of possible completions is too long to fit on a simpler control. Here we have entered "p" and chosen Search | Complete Symbol. There are many symbols starting with p. Choosing Search | Complete Symbol when "page-" is entered displays this simpler dialog without a title.